It’s a pretty cool time to be an educator in the city of Indianapolis. My teacher friends and I feel blessed to be able to serve kids at this historic time in a city at the forefront of education reform in this country. We feel like surfers who have caught the perfect wave - and we plan on riding that wave for just as long as we can. Thanks to organizations committed to improving the educational lives of the city’s children like The Mind Trust, The Friedman Foundation and Eli Lilly, the number of schooling options in Indianapolis has never been greater. Today parents have a real opportunity to choose a school that provides the best fit for their child. Many of these schools are new and offer non-traditional approaches to teaching and educating kids. Our school, Carpe Diem Meridian, is one of those schools and provides a good example of the type of educational innovation taking place in this city. So just what is it that makes Carpe Diem unique? When describing our school to parents, we generally focus on three things: 1) our personalized learning approach, 2) our strong school culture, and 3) our focus on preparing students for success in life. First, our approach to personalized learning can be described in this way: Carpe Diem is a one-room schoolhouse for the 21st century. Instead of just one teacher teaching every student all subjects, we have five teachers each specializing in a content area (Math, English Language Arts, Science, Social Studies, and Health and Wellness). Additionally, students are assigned a digital course in each subject area. In that way, students receive “twice” the instruction of a traditional school – first from a high quality teacher in the classroom and second from a rigorous digital course. When students first enroll at Carpe Diem they are given a series of assessments in order to gauge their instructional level. If a 6th grade student is strong in Math, they may be assigned to a 7th grade digital Math class. If a 9th grade student is a struggling reader, they may be assigned a 7th grade level English course and provided extra help in order to raise them up to grade level by the end of the school year. Our goal is to place students in a “just right” instructional level – not too hard (where they can become discouraged) and not to easy (where a student is not appropriately challenged). The second quality that distinguishes Carpe Diem is our strong school culture. We have only three rules: “Be Responsible, Be Respectful and Be Empowered” and our kids recite those rules at the beginning of each school day. 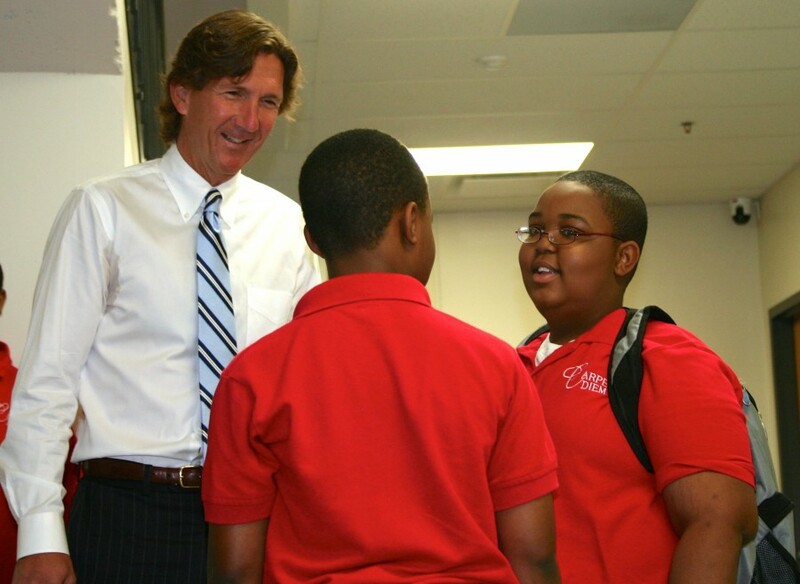 Our core belief is that every child in our school can be academically successful. As a result, we mix both high expectations with high accountability. One distinguishing feature of our school is the high level of transparency regarding academic performance. Thanks to our digital curriculum, each staff member is able to track the academic performance of each student in real-time. In turn, we leverage this data to revise our lesson plans and instructional efforts based upon the unique needs of each student. Additionally, this “data dashboard” feature allows parents to track their student’s progress from home or office at their own convenience. The third quality that makes us unique is our commitment to preparing students for success once they leave our school. We do not share the conventional belief that every student must attend and graduate from college in order to prepare for a successful career. Instead, we believe that each of our students must make a commitment to gain post-secondary skills in the career of their choosing. For some students this may require a college degree; for others it may require industry certification from a trade or vocational school. In either case it is our responsibility to provide our kids with a “map” so that they know what it takes to acquire the skills necessary to be successful in their chosen career. I smile every time a parent asks, “Is Carpe Diem the right school for my student?” And the reason I smile is because ten years ago a parent stuck in a neighborhood with a low performing school couldn’t ask that question. Today they can – and that is a good thing. Carpe Diem is just one quality school in a city with an increasing number of quality school options. In terms of educational reform, that represents real progress and should give us all a reason to smile. How do you feel about students being placed in a "just right" instructional level? Do you like that concept? Dislike? Have you heard of other schools that are similar to Carpe Diem and its personalized learning approach? Let us know in the comments below, and on social media using #AmGradIndy. Mark Forner is the founding principal of Carpe Diem Meridian, a grade 6-12 charter school located in Indianapolis, Indiana. 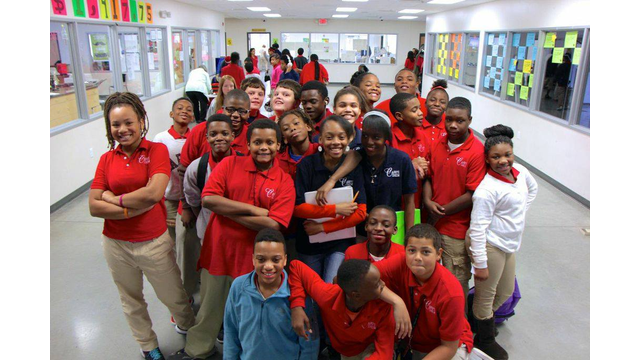 The school, located near downtown Indianapolis, serves an urban mix of students: 70% African-American and 65% students living in poverty. A 2009 Teach For America Indianapolis corp member, Mark Forner spent three years in the classroom as a Middle School Mathematics teacher for Indianapolis Public Schools. Forner has a B.A. in Economics from Kalamazoo College, an MBA from the University of Notre Dame, and a PhD in Educational Leadership from Western Michigan University.